The Nature Conservancy of Canada (NCC) is known for thinking big. Our projects span hundreds of kilometres, protect long-ranging wildlife corridors, cross provincial borders and even extend across nations. Big Trout Bay is one of these projects. 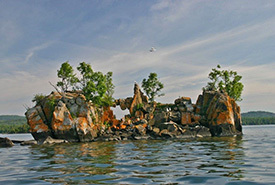 Located on the north shore of Lake Superior, the spectacular 1,018-hectare (2,500-acre) property is one of the last privately owned, undeveloped stretches of shoreline between Duluth, Minnesota, and Thunder Bay, Ontario. Located just minutes from the international border, and 45 minutes from Thunder Bay, Big Trout Bay’s densely forested land is crucial to several native species. This includes bald eagles and peregrine falcons, which are assessed as a species of special concern by the Committee on the Status of Endangered Wildlife in Canada (COSEWIC). 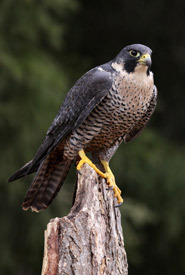 Peregrine falcons are one of Canada’s success stories. In the 1970s, these raptors were almost extinct in Canada due to the use of industrial pesticides. But thanks to conservation efforts, their populations have begun to bounce back. Big Trout Bay is just one of the ways NCC is helping to protect habitat for species like the peregrine falcon. 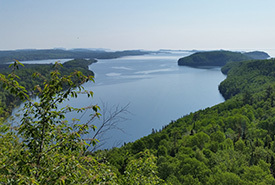 Big Trout Bay is composed mostly of coastal boreal forest. Nearly half of Canada’s bird species rely on boreal habitat to complete their life cycle. Many of these species migrate throughout the Americas. The property also protects 21 kilometres of undeveloped shoreline with towering cliffs, stretches of open bedrock and rugged cobble beach. These shoreline areas are especially important for biodiversity. They provide varied habitat for species such as bird’s-eye primrose, lake trout and moose. 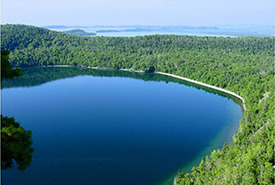 Through partnerships on both sides of the border, NCC will ensure that this stunning example of North American natural heritage remains a home for wildlife, a haven for recreation and provides vital sustenance to the Great Lakes Basin on which the U.S. and Canada both rely so heavily. NCC firmly believes in making our properties accessible to nature lovers and encourages visitors. Many of NCC’s properties in Ontario provide excellent hiking, birdwatching, nature photography and other recreation opportunities. Going forward, as we steward the lands of Big Trout Bay, trails may be developed to make it even more accessible to nature lovers in the area.